alaTest heeft 295 reviews verzameld en geanalyseerd voor Basis Peak. De gemiddelde beoordeling voor dit product is 3.8/5, vergeleken met een gemiddelde beoordeling van 4.2/5 voor andere producten in dezelfde categorie. We hebben de consumenten- en expertbeoordelingen, de leeftijd van het product en andere factoren geanalyseerd. Vergeleken met andere producten in dezelfde categorie krijgt de Basis Peak een alaScore™ van 88/100 = Zeer goed. The real-time heart-rate tracking isn't perfect, but it comes close. And with automatic sleep tracking and an improved industrial design, the Basis Peak is much better than its predecessor. The new Basis Peak smartwatch aims to take care of everything and encourage you to better sleep and fitness, but the overall equation isn't perfect yet. 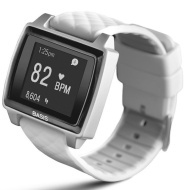 The Basis Peak is a fitness-focused waterproof smartwatch that runs for days on a single battery charge. It passively measures heart-rate and steps, with little need for intervention from the user. Its swipe-based interface is almost too smart for its own good. Many promised features won't be available until future firmware updates. The watch isn't very attractive or stylish, and its mobile app design is far behind competitors like Jawbone. Despite some smart features, the Basis Peak is a fitness watch that's impressively automatic but too limited and unfinished to feel like a truly great product. But, how do I adjust the time, which is stuck in Daylight Savings? Basis also announced a premium titanium edition of the Peak activity tracker, along with a new line of leather straps.